We would like to start the way of solving problems in the chapter units and dimensions with a problem that deals with the energy and expressing it in another non convention form of units. We know that, if we have energy, we can do work and vice versa. So the work done and the energy are having the same units and dimensions. 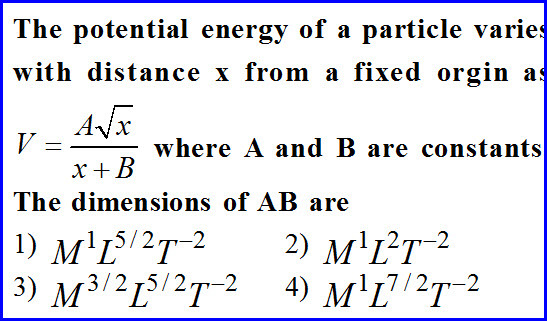 Work or energy can be measured as the dot product of force and displacement. 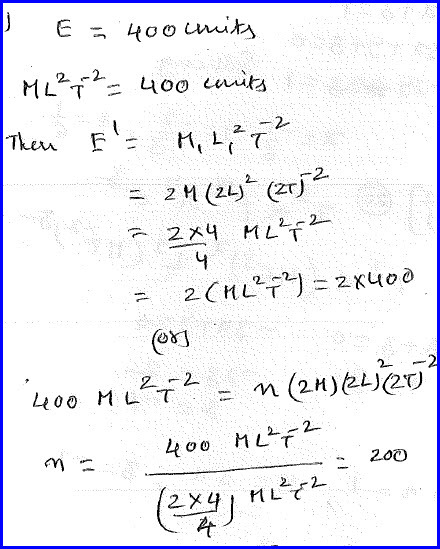 Thus it will have units that are the product of units of force and displacement. We can express its dimensional formula and it is representation of the physical quantity in terms of fundamental quantities. By converting them into new terms as shown in the diagram below, we can solve the problem as shown in the diagram. 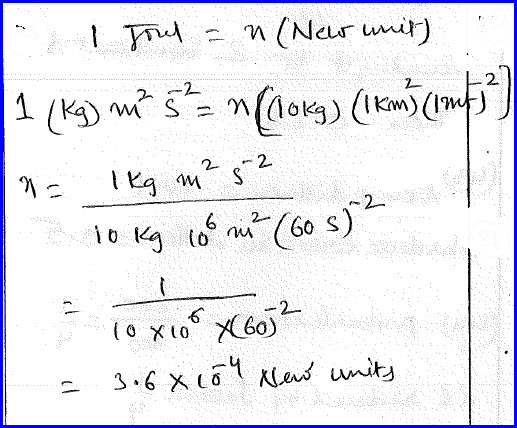 In this problem, we need to express young's modules in terms of velocity, acceleration and force. The problem is as shown in the diagram below. Young's modulus is used to measure the elastic nature of the material. It is mathematically defined as the ratio of stress and strain. Stress is further defined as the restoring force acting on a body per unit area and the longitudinal strain is the ratio of change in the length of the body to its original length. Thus young's modulus has the dimensions of stress per strain. We need to express this in terms of velocity that is defined as the rate of change of displacement. Acceleration is defined as the ratio of rate of change of velocity and force is defined as the rate of change of momentum. By using principle of homogeneity, we know that any equation shall have same dimensions on both the sides of the equation. By using this concept, we can solve the problem as shown in the diagram below. The problem is about potential energy. It is the energy possessed by the body by virtue of its position. We need to express it in terms of distance and in terms of some constants. We need to find the dimensions of that constants. 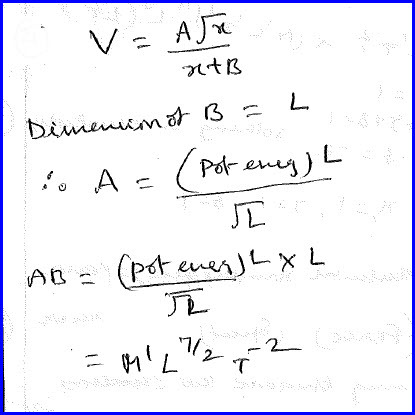 As the left hand side of equation is potential energy, the right hand side shall be the same. 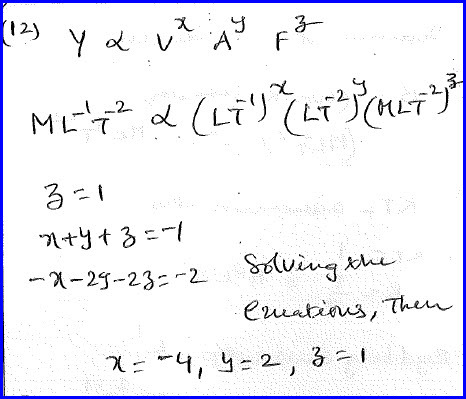 In the denominator, we are adding a constant with displacement with a unknown term. As we can add only similar physical quantity, that unknown term is also displacement. With the combination of the numerator, we shall get energy. The problem is solved as shown in the diagram below. 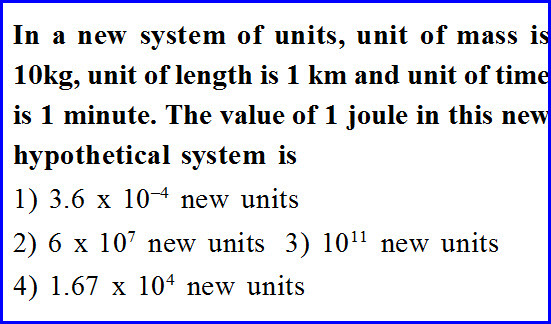 The last problem of the post is about expressing joule in terms of the new physical quantities that the present in the problem as shown in the diagram below. 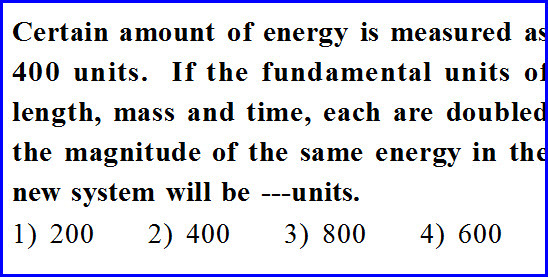 We can express energy in terms of fundamental quantities like mass, length and time with different dimensions. But now we need to express it in different terms different terms of units of length, time and mass. The problem is solved as shown in the diagram below.